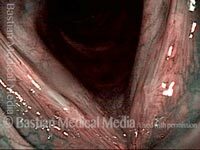 A peculiar and uncommon type of laryngitis that causes the mucosa to ulcerate. With ulcerative laryngitis, there is usually a white area of apparent mucosal necrosis with a surrounding rim of intense erythema. Recovery of voice is slow, often taking several weeks, in contrast to more typical forms of laryngitis. The causative agent is not known to us at our practice, though we have some theories. This woman developed a sore throat and lost her voice a week after a chemotherapy treatment for her metastatic breast cancer. Here, 6 weeks later, note the hazy area representing resolving “ulcerative” laryngitis (surrounded by tiny dotted line). There is a synechia attaching the cords together. The flexible scope has been used once to “twang upwards” from below in order to detach the cords from each other. At the arrow, slight separation can be seen. Just after the second attempt. That is, for the second time, the scope was passed below the cords, angulated sharply underneath the synechia, and then pulled upwards. The adhesion has been released. Voice is instantly and dramatically restored (though still hoarse, of course). Severe ulcerative laryngitis. Mucosa has sloughed away in the area of the white patches, not yet re-mucosalized. As is typical for ulcerative laryngitis, the mucosa takes 6 weeks or more to regenerate. This is six weeks after photo 1. Soon after this examination, voice returned to nearly-normal. About 7 years later, the voice remains essentially normal. Still, in this standard light view, one can see a faint white area in the area of the original ulceration. This is better appreciated in the next photo. 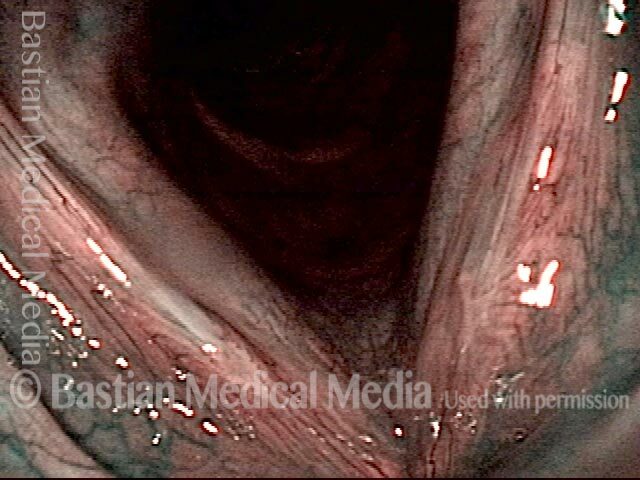 Under narrow band light, the (originally) more deeply ulcerated right vocal cord (left of photo) remains more avascular than the left (right of photo), where the capillary pattern has returned, but still with a demarcated area of reduced micro-capillaries causing a whiter appearance.